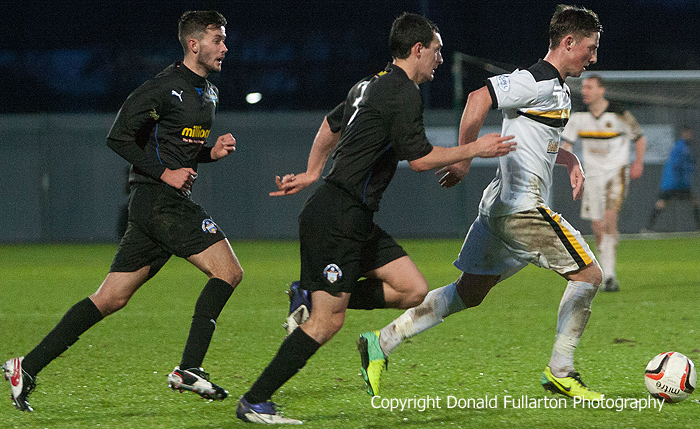 DUMBARTON welcomed first foots Greenock Morton to the Bet Butler Stadium, and then gained a valuable victory. DUMBARTON welcomed first foots Greenock Morton to a wet and windy Bet Butler Stadium, and then gained a valuable victory. A crowd of 1,450 turned out for a match crucial to both sides, with Morton trying to come back from a miserable start to the season which sees them in bottom place in the SPFL Championship, while Sons are trying to consolidate clear of the relegation play-offs. In the end home manager Ian Murray was a much happier man than Morton's new manager Kenny Shiels who spent the whole match moaning at referee Kevin Clancy. Dumbarton dominated the first half and had numerous chances before skipper Andy Graham netted when he latched on to a pass from new signing Mark McLaughlin, but he was ruled offside. It looked as if a goal would never come, but it did not long before the interval. The appropriately named Reece Hands handled in the box, a penalty was awarded, and Bryan Prunty converted with ease. After the break the visitors came more into the game, but at times looked as if they had never met each before. Keeper Stephen Grindlay, replacing the injured Jamie Ewings, had few saves to make. The clincher arrived a few minutes before the end when the second New Year signing, on loan striker Chris Kane from St Johnstone, headed home a cross from Colin Nish. There was no way back for the Greenock men. The picture shows Jordan Kirkpatrick leaving two defenders trailing.